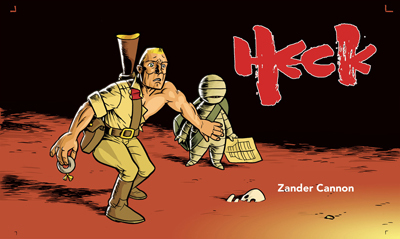 Zander Cannon’s HECK is a devilish little slice of comics. Just published by Top Shelf in its original strip format, the deadpan fantasy tells the story of Hector “Heck” Hammerskold, a fallen high school football star who slinks back home after the death of his father, and inherits his family’s spooky old Victorian mansion, which just happens to house a portal to Hell. So Heck and his little buddy Elliot, the obsequious waterboy who still sees the faded idol as a star, set up a business running messages between the living and the damned. Cannon’s book has all the trappings of a rip-roaring yarn, complete with terrifying creatures, rousing derring-do, a femme fatale and a stolen-treasure mystery, a square-jawed hero, and an astonishingly rich & fully developed metaphysics. But underneath its fun and familiar trappings, HECK has a ragged, disappointedly mortal core. It’s a story of regret and loss, of the inevitability of sin and temptation. It asks hard questions about the value of friendship and the nature of love, and doesn’t come up with any easy answers. It’s a skewering of the Hero myth and a celebration of the heroic heart. HECK’s Hell is a place you come to find out who you really are. When you wind up there, you realize you’ve already been there all along. The story tears its characters to pieces, cutting and condemning until it finds something that refuses to be damned. This entry was posted in Art Appreciation, Reviews and tagged review, zander cannon. Bookmark the permalink.